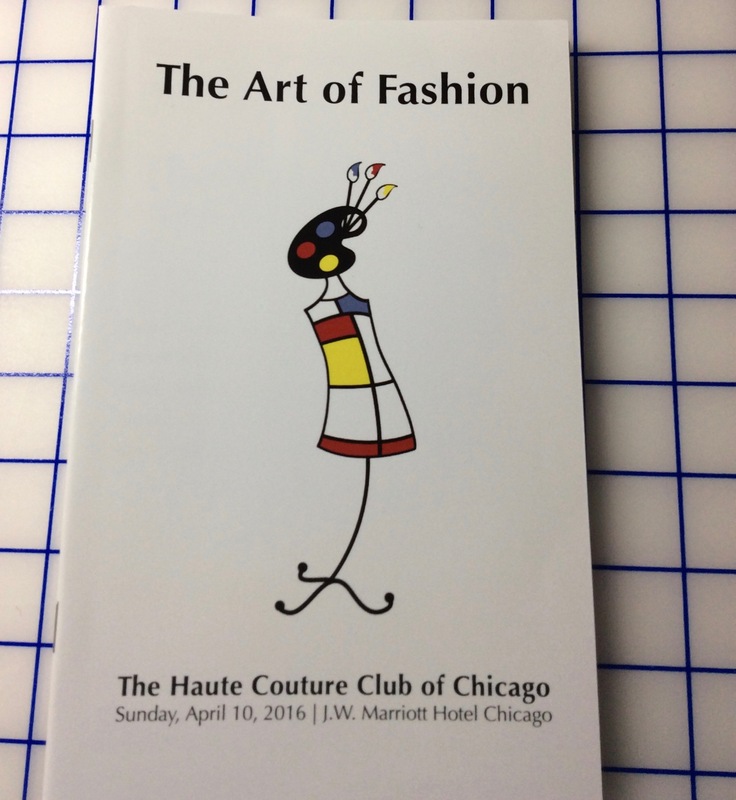 For the past year, I have had the privilege of co-chairing the annual fashion show and luncheon presented by The Haute Couture Club of Chicago. This organization was founded in 1964 by a group of women who had taken tailoring classes from Helen Barker. In its early days, the club had an entrance requirement, which was the completion of a tailored jacket or coat that included a traditional notched collar. That requirement has since been eliminated and members are drawn together by their love of garment sewing. 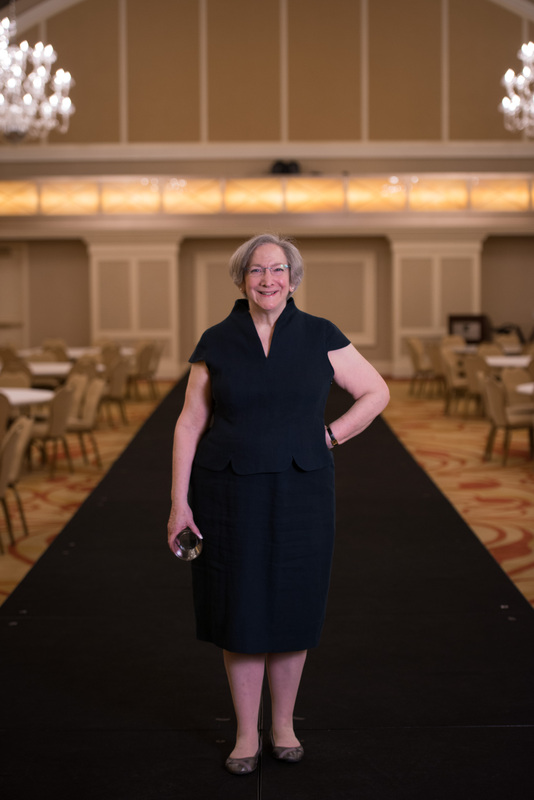 I worked on the club’s 50th anniversary show and on last year’s show, and so I felt I was familiar enough with the process of putting a show together to partner with Susan Gerbosi in this adventure. We began last spring, planning our theme, searching for a venue, brainstorming possible show segments tied to the theme, selecting a photographer and mapping out the countless details involved in bringing a show to the runway. The club has monthly meetings with educational programs from September to May and presents challenges to members tied to the fashion show. 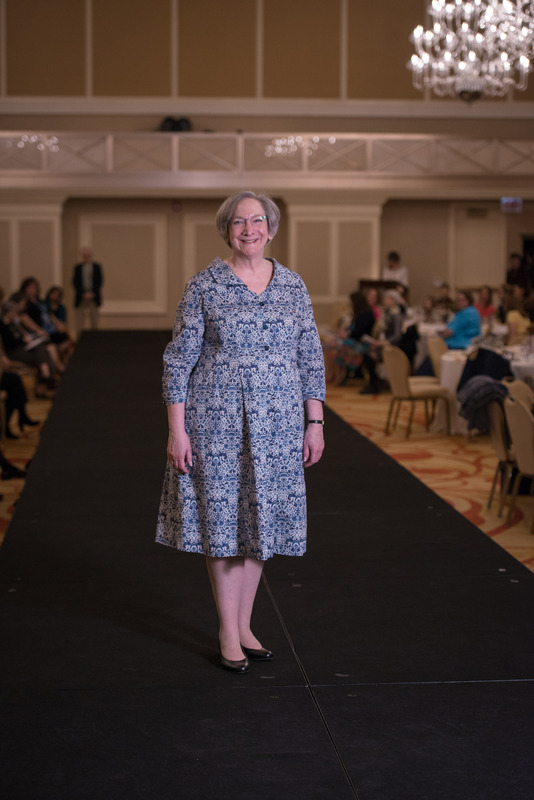 The club’s shows also involve garment reviews with sewing educators that help members with any tweaks needed in their garments and give styling suggestions for the runway. 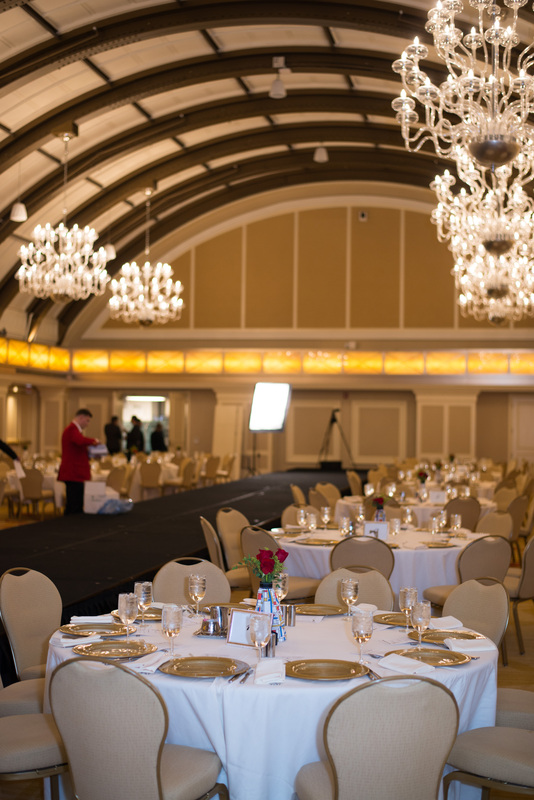 We were ecstatic when the board approved our first choice of venue, the historic Burnham Ballroom at the JW Marriott Chicago. The setting provided the perfect showcase for our members’ work and elevated the experience for everyone. I cannot say enough good things about the professionalism of the staff and the level of service they provide. Everything on the day of the event went off without a hitch and they made me feel as if ours was the most important event they had ever hosted. Whenever I volunteer to work on a fashion show, things get really busy at my office and this year was no exception. Juggling that, plus all the things that needed to be done for the show meant that my sewing schedule became more and more compressed. And there was absolutely no time for blogging. I was determined to show all four garments we had included in the program, but that meant having to accept the offer of help from two dear friends. Those are the loving hands of my friend Stephanie King, who took over from our emcee for the show, Sarah Veblen. Here is Sarah, briefing the models before the show. Sarah volunteered to provide commentary for the show last spring. She wanted to look at the garments up close on the morning of the show and talk to the members who made them so she could add her own personal comments when they were on the runway. 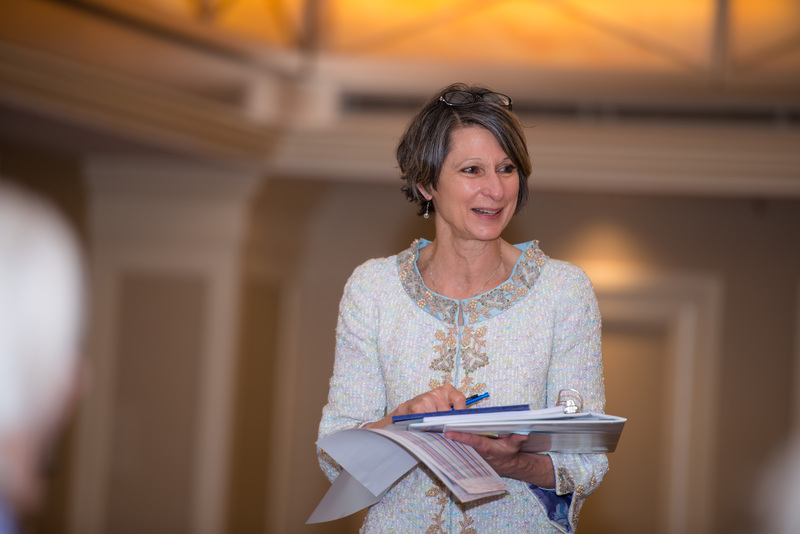 When I developed a new garment submission form to use in this year’s show, Sarah added questions of her own so we could have more to draw on when Susan and I prepared the program and when the commentary was drafted. What Sarah didn’t count on was that I hadn’t been able to draft any of the commentary before she arrived in Chicago and she had to spend two very full days working on it. Here I am helping our fabulous photographer, Peter Thompson, prepare to take the runway photos. 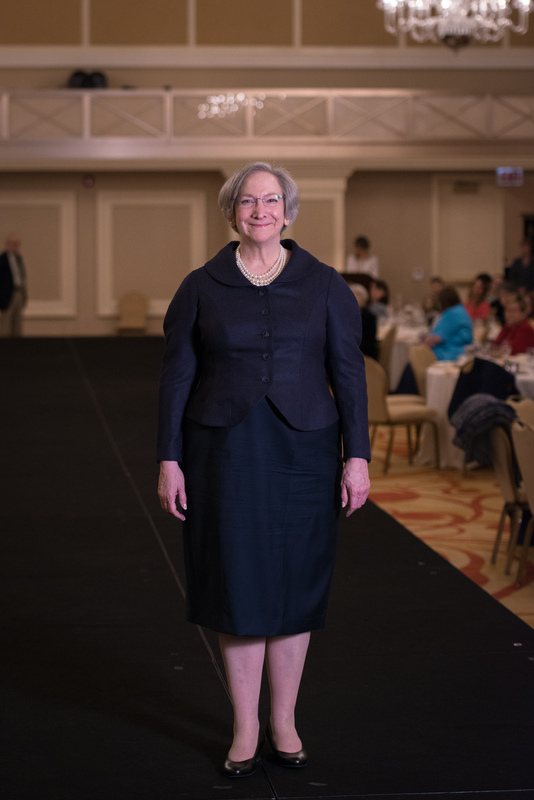 The dress I had hoped to make for the luncheon never even got cut out, so I wore navy linen on a day with rain and snow. Who cares, right? I did change into heels when our guests began arriving. 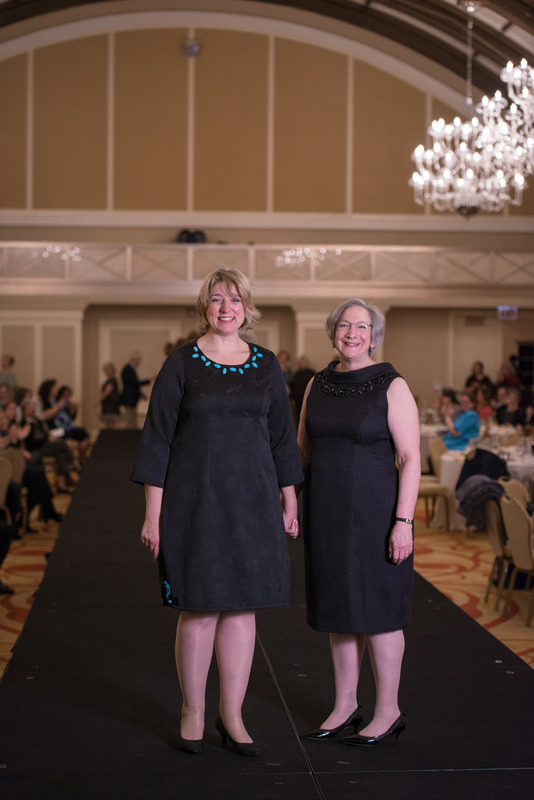 The first show segment was “My Homage To…” This was also the first of the sewing challenges this year, in which members were asked to pay tribute to a designer, artist or art movement. The jacket you see here is my homage to Le Bar Suit, which was part of Christian Dior’s debut collection in 1947. If the lines look familiar, it is because this is the second version I made in the space of a year. I documented my frustrations with the first version here. I will give you the details of this version in an upcoming post. Another segment was “My Signature Style.” I was inspired by the book Lessons From Madam Chic to think about what defines personal style. 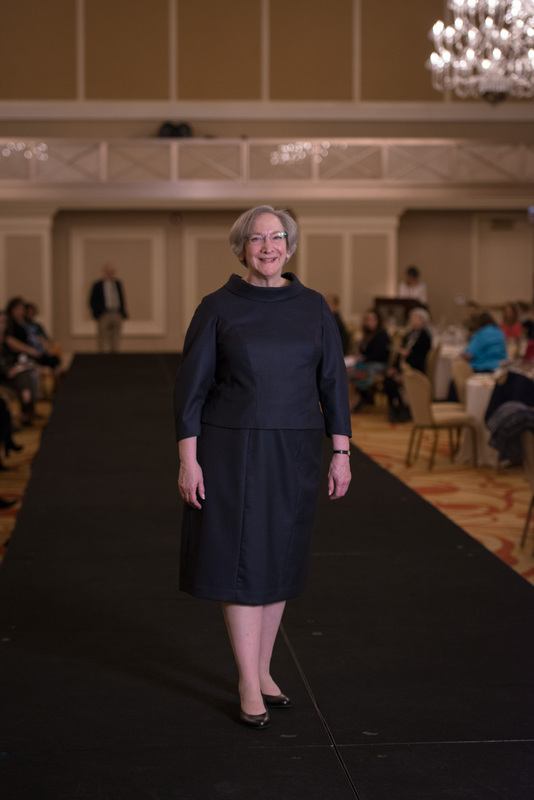 I chose to make this two-piece dress with a bias rolled collar that evokes the early ’60s, not just because I feel great in the first version that I made, but also because I’ve been told that it suits me perfectly. The color of the first version wasn’t quite right. I’m much happier with this navy and black birds-eye weave wool. My third trip down the runway was in this cotton lawn shirt dress. I hadn’t planned to put this dress in the show, but we created a segment we called Day Dress Renaissance when we were preparing the lineup and decided this dress fit right in. Susan insisted on giving me the honor of closing the show. We appeared on the runway together in the final segment, which we called Gallery Opening. This Little Black dress is the one that made it to the runway with the help of friends and needs to be finished on the inside before I wear it to a wedding in June. 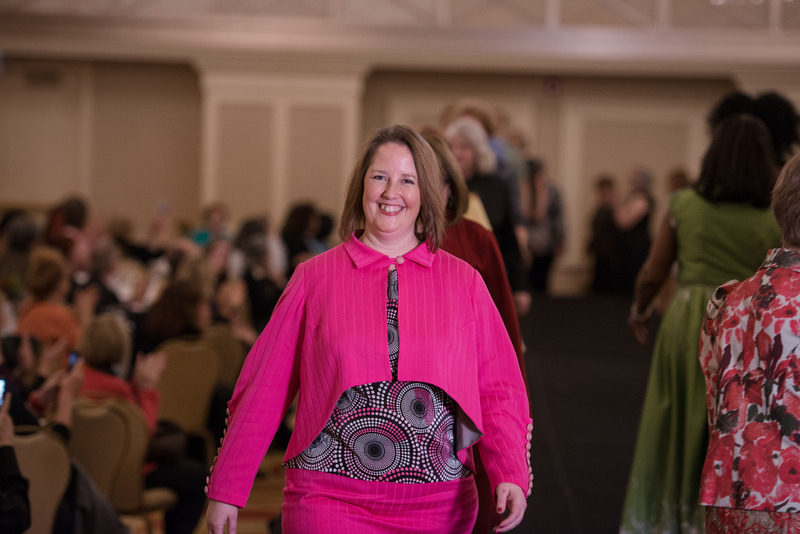 Here is my dear friend Stephanie King walking in the finale with a radiant smile. 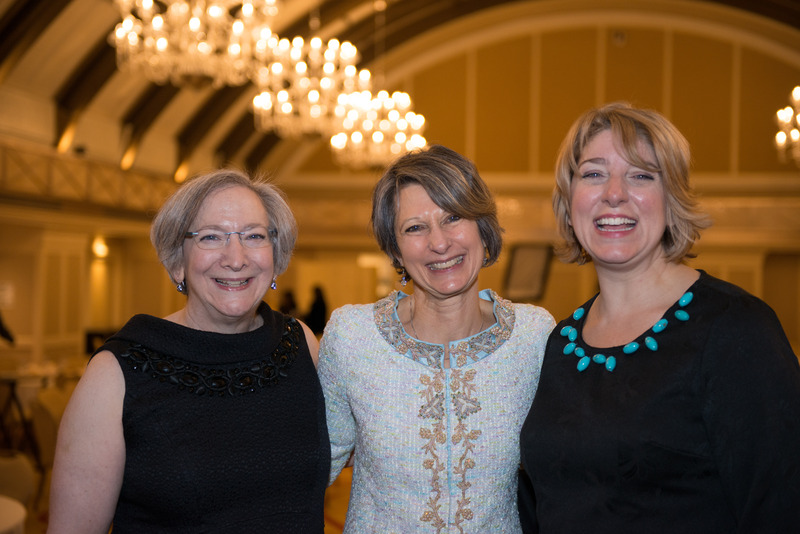 And here I am with Sarah Veblen and Susan Gerbosi, happy that we produced a lovely fashion show that everyone enjoyed.